Mr. Rescue Plumbing & Drain Cleaning of South Gate has been offering a second to none plumbing and drainage service since 2007. And by providing great plumbing and drain services customers recommend Mr. Rescue Plumbing & Drain Cleaning of South Gate globally. Today Mr. Rescue Plumbing & Drain Cleaning of South Gate is providing the expert plumbing and drain services in US, Canada and UK. Because we consider customers human not transactions. 45 Minutes response time, up front pricing, world class customer service, no over time on nights and weekends makes Mr. Rescue Plumbing & Drain Cleaning of South Gate different from others. We stand behind our work and warranty. Our certified technician will arrive within 45 minutes and will give you price before doing any work and will leave the work place clean as it was before. Whether it's a dripping faucet or a broken sewer lateral plumbers at Mr. 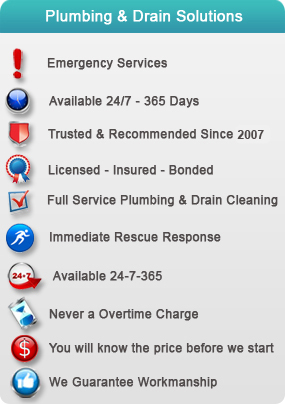 Rescue Plumbing & Drain of South Gate Cleaning does all. A Mr. Rescue Plumber will enter your house with shoe covers and what makes him different from other plumbers is he will never park the van on your driveway. Keeping the same respect for your home he will cover the work area with the protective mats and will leave the work area clean. Respect and care for your house is the most important tool we carry. Technology - Mr. Rescue Plumbing offer advanced, state-of-the-art water treatment technology. Solutions - Mr. Rescue Plumbing have the widest range of solutions available, with a solution to fit every home and every budget. Service - Our trained and certified technicians are among the best and offer the best service and maintenance in the industry. Satisfaction - 100% Satisfaction Guarantee ensures that your Mr. 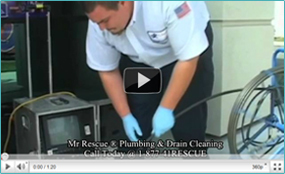 Rescue Plumbing expert will address your problems professionally.